“Nick, The No Good, Icky Tick” Book Reading & Signing! Join us at Tender Years in Mechanicsburg as our students enjoy a book reading & signing with author Karen Gloyer. 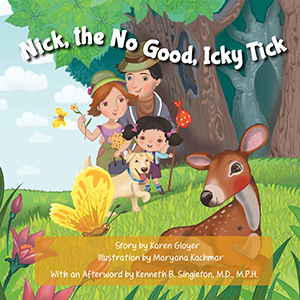 Karen will present her children’s book, “Nick, the No Good, Icky Tick”, a fun and colorful story that serves as an educational tool to teach children and parents about Lyme Disease, from how the disease is transmitted by no good, icky ticks like Nick, to identifying and treating the disease. An estimated 300,000 people are affected by Lyme Disease each year in the United States. Our goal with this entertaining and educational event is to give children the knowledge they need to reduce their risks of contracting it. PLUS, get a signed copy of the book at the event for just $19.95!